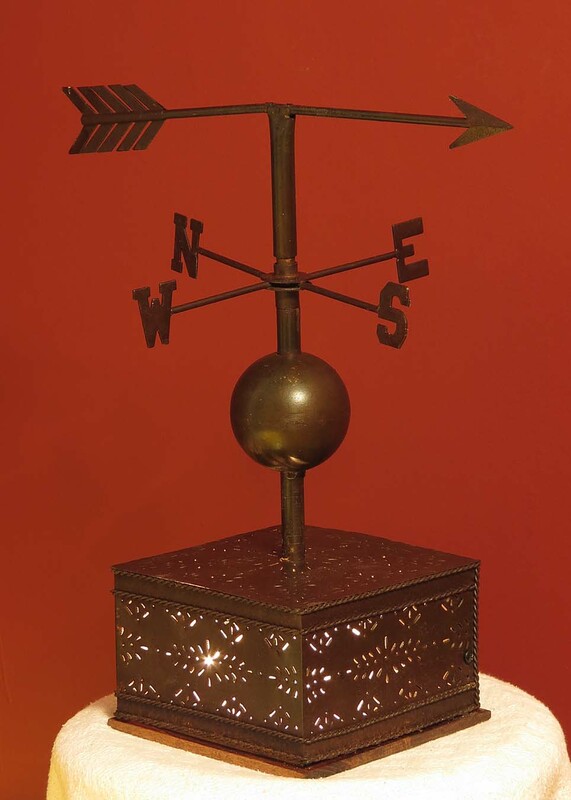 This rusty weathervane leaped out at us in the store where we found it – in fact, it was a toss up as to whether we were going to keep it for ourselves or not. This weathervane must have graced some fancy carriage house, as it came with a beautiful filigreed mounting box that called out for some highlighting. We’ve sealed the rust on the weathervane and added 2 ceramic sockets and 2 night light bulbs inside the base so that the light glows softly through the openings. It’s definitely not a lamp to read by, however, it would look great casting shadows in a corner or on top of your antique buffet. All electrical parts are new. Supplied with approximately 6 feet of black vinyl cord, and in-line on/off toggle switch. Supplied with 2 candelabra sockets and 7 watt incandescent bulbs. The bulbs are accessed by unscrewing 2 screws on the base. The sockets are rated to 40 watts, but beware of the metal base heating up if you put in stronger bulbs. If you’d like more shadows, more powerful LED bulbs would be best, as they will not heat up – and will last a long time too. Please read safety information before purchase.